This brings several questions for people who are already insured with a Private Integrated Shield Plan (IP). Below are some of the questions I have encountered and my answers to each. 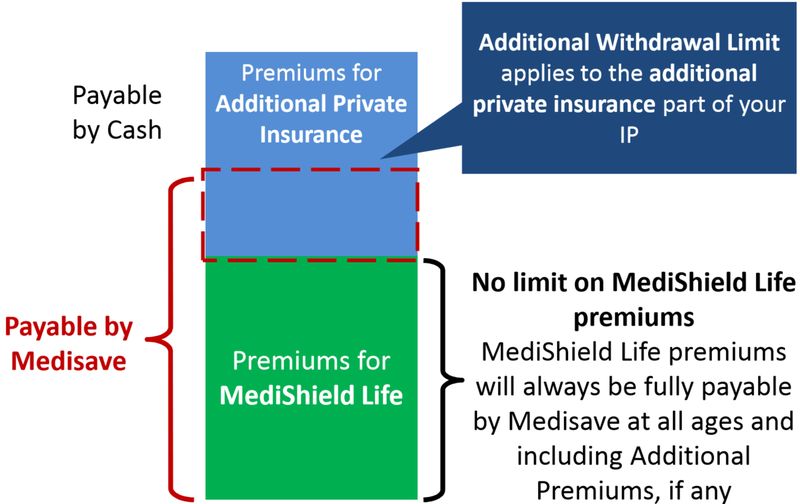 If I have an IP plan and MediShield Life, does that mean I am paying for two policies? MediShield Life is the foundation on which IP plans are built. There is only one plan and there is no duplication of coverage or payment of premiums. If you have an IP plan, you will pay one single premium directly to your private insurer. The MediShield Life portion will be sorted out at the back-end between your insurer and the CPF Board. How much can I claim under MSHL and how much under my private IP plan? You can submit your claim to your private insurer. The part of the claim that MSHL can cover will be provided by the CPF Board to your insurer. Your private insurer will then provide the entire payout to you. How is my IP premium affected? The MediShield Life portion of your IP premium has increased from what it used to be under MediShield, but is fully payable by Medisave. The additional private insurance portion of IP premiums is payable by Medisave, up to an Additional Withdrawal Limit. Additionally, all 5 IP insurers have committed to not changing the additional private insurance coverage component of premiums for IPs in the first year after the launch of MSHL. You may be eligible for certain premium subsidies. To understand which subsidies you are entitled to and how they work, there is more information on MOH’s website. What is the Additional Withdrawal Limit (AWL) for my age group?